There are more than a few areas in which the NHL could stand to follow the NBA’s lead. Marketing their stars, targeting growing and untapped markets, and simply being forward thinking in the presentation of the game. It’s unlikely that the NHL will ever surpass the NBA in terms of popularity and revenue, but taking basketball’s lead in an attempt to grow hockey’s footprint – and ultimately the league’s revenue – is a method which could pay dividends for the NHL. The only remaining hurdle seems to be the NHL’s inability to get out of their own way. More often than not it appears that the NHL is more than happy to stay in their lane and keep their head down when it comes to presenting the sport. It’s not that the product is bad, per se, but that the league doesn’t seem to be willing to explore new opportunities or look at things in a different manner. Forget about six years without a trip to the playoffs — suddenly, things are looking good for Buffalo Sabres fans. Yes, a good chunk of that optimism might stem from hiring a general manager who helped build three champions in 10 years at Pittsburgh. Or the fact that the new GM plundered the staff of the other Stanley Cup finalist for his new coach — who just happens to be maybe the greatest blue-liner in Sabres history. The Sabres new uniforms aren’t royal blue and that’s okay. 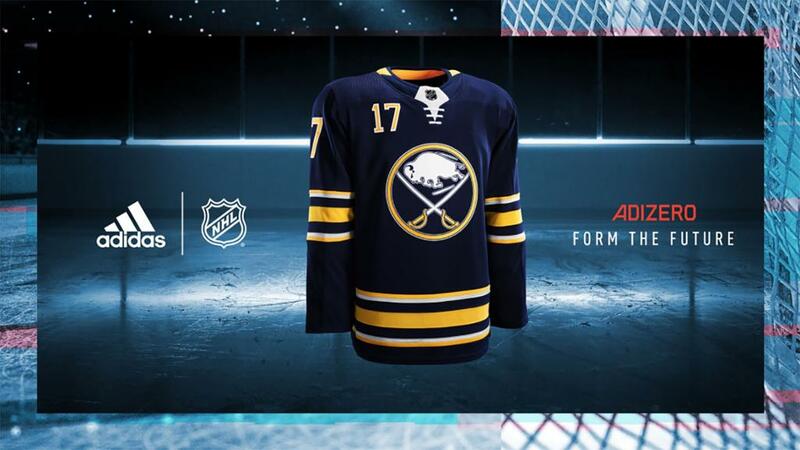 The slight tweaks the Sabres jerseys received in the Adidas changeover drastically improved the overall look of both the home and road jerseys. In conjunction with Adidas and the NHL, the Sabres took a step away from the grey/silver accents that have graced the uniforms since featuring prominently during the red and black era and being utilized as an accent on the Slug jerseys. Gone are the wildly unpopular apron stripes and arm pit accents.